Terra Blues potato chips are more healthful than most snacks, but they’re not a meal. While customers may still think of JetBlue as a low-cost carrier, it isn’t really. Planes have more legroom than the industry average, every seat has its own TV screen and there is no surprising charge for carry-on luggage. But JetBlue is also not a legacy carrier flying to every corner of the world, offering full service, premium seats and airport lounges. In July, JetBlue announced an end to its egalitarian all-coach-class flights. Beginning in June 2014, the blue airline will offer premium-class seats on its transcontinental flights from New York to Los Angeles and San Francisco. The premium seats are a cornerstone of Chief Executive Officer David Barger’s “lifestyle brand” strategy. JetBlue praises itself as a hybrid, being in the “sweet spot”, he said. The New York-based carrier follows a different path from the two established business models for airlines in the United States: network carriers and low-cost airlines. JetBlue’s prices are in the low range and the company offers a high-quality flight experience. But it falls short in not offering an international network, which keeps cost low. It is primarily a point-to-point carrier; 85 percent of JetBlue’s passengers fly directly to their destination. Formerly known as a low-cost carrier, JetBlue now offers onboard entertainment, more legroom and a frequent flyer program. It allows use of electronic devices throughout flights, and wireless Internet will soon be introduced. Starting in mid-2014, JetBlue plans to disrupt the business-class market on its busiest routes, from New York to Los Angeles and San Francisco. To attract the most lucrative passengers, JetBlue plans to undercut its competitors’ prices. “People are clearly overpaying for what they get,” said Chief Commercial Officer Robin Hayes during an earnings call in October. Currently JetBlue sells its premium tickets for a return flight in July 2014 from New York to Los Angeles for $1098, while Delta, a competitor Delta, charges $4324. First JetBlue will offer 16 premiums seats on each of its seven daily flights between JFK and Los Angeles. In 2015 the airline plans to add premium seats on its flights between JFK and San Francisco. JetBlue’s strategy has to be seen in the context of a consolidating airline industry. After years of overcapacity, rock-bottom prices, bankruptcy and consolidation, the industry is finally doing better. As part of its growth strategy, JetBlue is focusing on high-density markets like New York, Boston and Florida, trying to attract business travelers and cost-conscious passengers. To understand JetBlue’s strategy shift, you have to go back to February 2007, when a winter storm left passengers stranded for 11 hours on the tarmac at New York’s JFK Airport. After the image disaster and losses that followed, Barger took over as CEO and halted the airline’s breakneck expansion. After returning to a positive annual net income in 2009, the airline started growing again: JetBlue built up San Juan, Puerto Rico, as a hub, became Boston’s largest carrier, added a frequent flyer plan, continuesto add routes in the Caribbean and just announced its first flight to Lima, Peru, its southernmost destination. Helane Becker, an analyst at Cowen Securities, says JetBlue and Alaska Airlines share similar strategies. Neither a legacy nor a low-cost carrier, Alaska Airlines operates out of a strong base in the Northwest, while JetBlue is focused on the Northeast. Although similar to JetBlue in number of passengers served and aircraft flown, Alaska Airlines is more profitable. While JetBlue is doing well, its competitors are doing even better. Year-to-date, Alaska Airlines stock gained 70 percent, while JetBlue increased 43 percent. Alaska Airlines price-to-earnings ratio trailing the last 12 months is 11.17, less than JetBlue’s 21.67. Although both airlines have similar annual revenues around $1.5 billion, Alaska Airlines’ income was four times as high. While Becker doesn’t dislike JetBlue’s strategy, she said she thought the stock will “marketperform”. While revenue grew steadily in recent years, profit margins stayed in the low single digits. JetBlue’s market capitalization of $2.54 billion is smaller than most of its rivals’ – including Alaska Airlines, which has a market value of $5.44 billion with a similar fleet size. Basic investments in the airline industry are expensive. 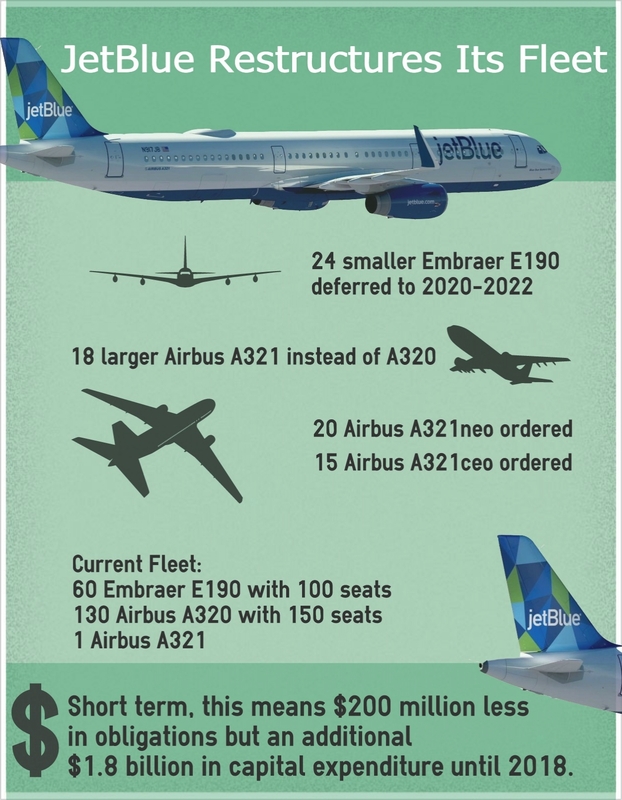 JetBlue is flying more than 160 aircraft and one of its Airbus A320 planes is listpriced for more than $90 million. Therefore, return of invested capital (ROIC) is a key indicator signaling how well an airline allocates its invested money. JetBlue’s ROIC was only 4.5 percent in 2012, while its competitors Alaska Airlines (15%), Delta (33.7%) or US Airways (20.6%) reported much higher returns. Although lower than that of its peers, JetBlue’s return of invested capital is appropriate to where the company is in its growth cycle, Derchin said. When JetBlue reported its third-quarter earnings, it also announced plans to buy larger jets, reflecting its shifted strategy. “We believe larger-gauge aircraft will allow us to better serve high-density markets and more effectively use our valuable airport slot portfolio in New York,” Barger said about the fleet restructuring. He acknowledged in the earnings call that maintaining a relative unit-cost advantage over legacy carriers is key to the company’s success. Excluding fuel costs, maintenance expenses have been the main cost driver for JetBlue this year, spiking 28 percent in the third quarter, as the engines of its E190 planes faced problems. With an aging fleet, maintenance cost is unlikely to decrease, but the company expects the increase to slow in the fourth quarter. The recent megamerger between US Airways and American Airlines has opened an opportunity for JetBlue to bid for starting and landing slots at La Guardia Airport in New York City and Ronald Reagan Washington National Airport. After the Department of Justice cleared the merger in November, JetBlue’s stock soared 12 percent in two days, outperforming the market and the ARCA Airline Index. Slightly missing analysts’ estimates, JetBlue announced $0.21 adjusted earnings per share and $1.44 billion in revenue in the third quarter of 2013, compared to $0.14 and $1.31 billion one year earlier. Passenger revenue per available seat mile, an important indicator of profitability, increased year-over-year by 5.4% to 11.8 cents but came up short of Alaska Airlines’ 12.0 cents. JetBlue’s spokesperson Loren Durán denied requests for any interviews with management.